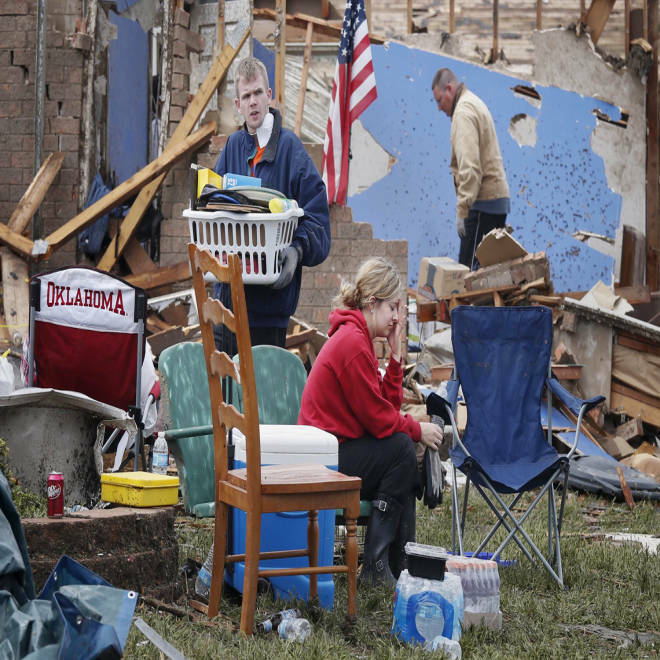 Taylor Tennyson sits in the front yard as family members salvage the remains of their home, devastated by the Moore tornado. The tornado that roared through the Oklahoma City suburbs earlier this week damaged or destroyed as many as 13,000 homes and did as much as $2 billion in damage, authorities said Wednesday. The figures underscored the colossal task facing emergency crews as they shifted their focus, two days after the storm, from looking for trapped victims to tackling the mountain of wreckage and helping displaced families. Authorities said six people, all adults, remained unaccounted for, but they said those people may simply have walked away from the storm and were not necessarily buried in the rubble. The tornado killed 24 people and injured more than 200. The $2 billion damage figure was given by Oklahoma City Mayor Mick Cornett and matched a preliminary estimate given by Oklahoma insurance officials to The Associated Press. That would make the tornado, which ravaged the city of Moore and parts of Oklahoma City, one of the most expensive in American history. The tornado that all but wiped Joplin, Mo., off the map two years ago did $2.8 billion in damage. Authorities in Oklahoma announced late Wednesday that they had identified all of the bodies, and they said that the youngest victims were infants, 4 and 7 months old. They said 10 of the 24 dead were children, up from an earlier figure of nine. Heartbreaking portraits of the dead began to emerge. 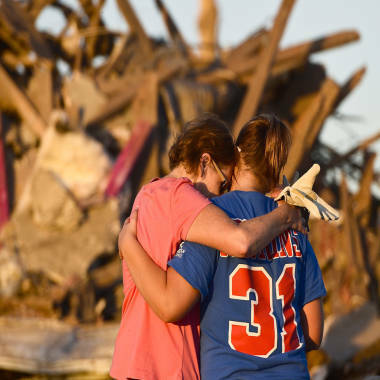 Among them were a third-grader remembered for her ever-present smile and a 65-year-old man separated from his wife when the tornado struck. Federal relief workers set out trying to reach families displaced by the storm but said they faced challenges: Cellphones were not working in some places, and other people were focused on salvaging their belongings before they registered for help. A White House official said Wednesday afternoon that 1,500 people had registered for federal help through the Federal Emergency Management Agency. Administrator Craig Fugate said teams were going through neighborhoods looking for more. A tour given to NBC’s TODAY of Plaza Towers Elementary School, where seven children were killed, revealed forgotten everyday fixtures of grade school — a basketball covered by splinters of wood, a tattered map of the United States, a textbook about the volcano destruction at the ancient Italian city of Pompeii. As cleanup crews faced acre after acre of wrecked homes, the federal government announced it would pick up 85 percent of the tab for debris removal for the first month, and 80 percent for the two months after that. President Barack Obama announced plans to visit Oklahoma on Sunday. Authorities faced questions at a press conference about why more people did not have “safe rooms” in their homes to protect them from tornadoes. Officials in Moore had complained about red tape in trying to secure federal grants to build the rooms. Gov. Mary Fallin said the state would open a donation fund to help pay for “safe rooms” for people who want them in their homes. But authorities brushed off questions about whether the state could have been better prepared. “It’s the anomaly of severe weather,” Ashwood said, referring to the strength of the tornado, which was classified Tuesday as a Category EF5, meaning it had packed winds higher than 200 mph. Meanwhile, the people of Moore planned to keep combing through the ruins and salvaging what they could.